Yorkshire Wildlife Park is offering free entry tomorrow. Military and emergency services personnel are being given free entry to Doncaster's Yorkshire Wildlife Park tomorrow to mark Armed Forces Day. The day gives a huge morale boost for troops and emergency services with events organised across the nation. “We are so proud and appreciative of the work they do and are delighted to offer free entry,” said John Minion of the park at Branton. They will see more than 400 species, including many rare and endangered animals who are at home on the 100-acre site. Free entry is available on the gate only and redeemable on presentation of an MOD Card, Veterans Card, Defence Discount Card or Blue Light Card, along with free travel to the park by bus. 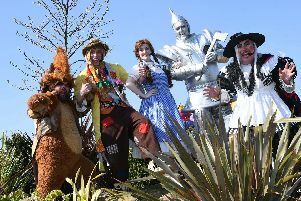 Look who’s going to be at Doncaster’s wildlife park for three days over Easter ….